Apple has posted a support document detailing the differences between GSM and CDMA iPhones, and the AT&T CEO criticized Apple's App Store business model, touting instead an interoperable carrier-driven HTML 5 application store. After years of selling only GSM iPhone models, Apple, along with Verizon, released a CDMA iPhone 4 last week. In order to head off possible user confusion, Apple has published a support document explaining the differences between the GSM and CDMA versions of the iPhone. "iPhone supports many phone features, including call waiting, call forwarding, and conference calls. Depending on your wireless carrier's network technology (GSM or CDMA), there are different methods for enabling and using these features," the support article read. 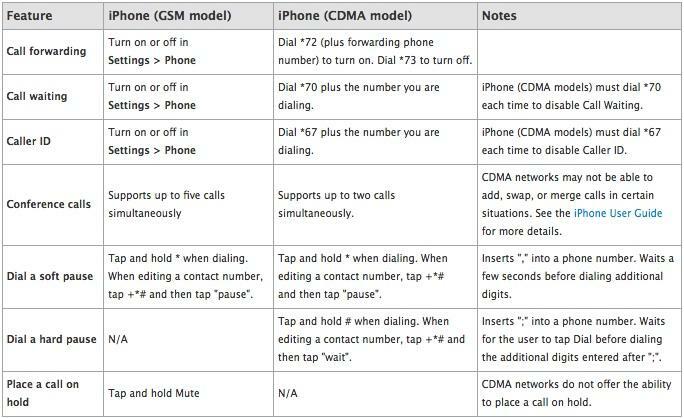 According to the accompanying chart, call forwarding, call waiting and caller ID settings can be adjusted in the settings pane of GSM iPhones, but on the CDMA iPhone, users need to dial numbers to enable or disable the features. In addition, GSM supports conference calls of up to five people simultaneously, while CDMA supports up to two calls simultaneously. "CDMA networks may not be able to add, swap, or merge calls in certain situations," the article noted. The one feature on the chart that the GSM iPhone lacks when compared to the CDMA iPhone is the ability to dial a hard pause. The CDMA version of the iPhone, however, is unable to place a call on hold. The document also noted that phone numbers that contain alphabetic characters beyond seven digits "may not dial as expected." Finally, due to the CDMA iPhone's lack of a SIM card, several SIM card-related features are unavailable on the CDMA iPhone. One week after losing US exclusivity of the iPhone, AT&T CEO Randall Stephenson expressed frustration with app stores that work on just one mobile operating system, the Associated Press reports. Speaking at the Mobile World Congress in Barcelona, Spain on Tuesday, Stephenson criticized companies like Apple and Google as restricting consumers. "You purchase an app for one operating system, and if you want it on another device or platform, you have to buy it again," Stephenson said. "That's not how our customers expect to experience this environment." Stephenson's comments are confusing, however, as AT&T's customers have indeed come to expect exactly "this environment" while enjoying exclusive access to the iPhone App Store in the US for two and a half years. Apple launched the App Store in 2008 and has since seen the number of apps available on the digital storefront swell to 350,000. As an alternative to the one platform model, the CEO touted the recently launched Wholesale Applications Community, or WAC. The WAC, which utilizes HTML 5, would allow carriers to sell applications directly to customers across a variety of devices. Mobile phone manufacturers LG Electronics, Samsung, Sony Ericsson, Huawei and ZTE have all committed to making WAC-compatible phones. The four largest carriers in the US —AT&T, Verizon Wireless, Sprint Nextel and T-Mobile USA —are all members of the WAC, according to the report. Despite declining to attend the Mobile World Congress, Apple's presence has still been felt at the event in remarks from Stephenson and other presenters. On a more positive note, the Cupertino, Calif., company took the trade show's top award for a mobile device. The iPhone 4 was awarded the title of "Best Mobile Device" for its "great screen, sharp design, fantastic materials, and phenomenal ecosystem for app developers."